Am Kleebach 12, 52080, Aachen, Germany. Institute for Applied Jedi Sciences, Valoun II, Outer Rim, Galactic Empire. Only about 5% of the total mass of the universe consists of ordinary matter (mostly protons, neutrons and electrons, which form atoms). The missing 95% divide into dark matter (ca. 25%) and dark energy (ca. 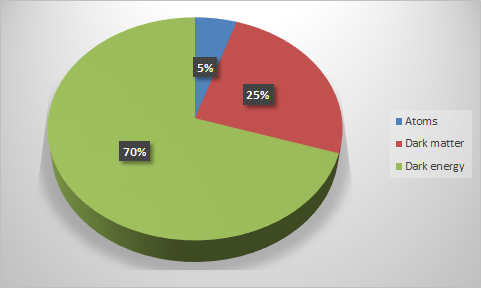 70%) (Planck Collaboration, 2013) – see Figure 1. In this study, I focus on the former one. Figure 1. Approximated distribution of matter and energy within the universe. The existence of dark matter is indicated by the effect of gravitational lenses and the orbital velocities in galaxy clusters as well as galaxy rotation curves (for more information see Carroll, 2007). Long story short, to explain some astronomic observations, there is mass missing, which is not visible to us. This missing mass is a result from the presence of dark matter. One candidate for dark matter are Weakly Interaction Massive Particles (so called WIMPs), which may be supersymmetric particles (Freund, 1988). However, experiments such as those of the Large Hadron Collider have not proven the existence of supersymmetry yet. I propose a different candidate for dark matter here. Galaxies with rotation curves influenced by dark matter are usually far, far away. Due to the limited speed of light, the events in these galaxies we observe now on earth happened a long time ago. Therefore, to find a new candidate for dark matter, let’s have a look at a place a long time ago, in a galaxy far, far away! This far, far away galaxy, where the plot of Star Wars takes place, is characterized by slightly different physics compared to our own galaxy. The differences in physics may be a result of the presence of dark matter. What are those differences? As long as they are not jumping into hyperspace and flying faster than light, space ships in Star Wars travel very slowly through space, similar to ships at sea (capital ships such as Star Destroyers) or planes (X-Wings or TIE-Fighters). They seem to be restricted by some medium, limiting their maximum speed. In addition, their engines emit sound waves, which propagate through the apparent vacuum, making, for instance, the characteristic noises of turbolasers and TIEs flying by (Lucasfilm, 1977). The corresponding sound waves have to travel through some medium filling the vacuum. This medium is our candidate for dark matter! In order to reveal its nature, let’s look at an additional characteristic of the Star Wars galaxy: the Force. The Force is an overall present force field in the galaxy, but it interacts only strongly with other atoms when used by a Jedi. According to Lucasfilm (1999), the carriers of the Force field are particles called Midi-chlorians . Obi-Wan Kenobi states: “The Force is what gives a Jedi his power. It’s an energy field created by all living things. It surrounds us and penetrates us.” Therefore, the Force seems to interact weakly enough to “penetrate us”, but interacts strongly with certain live beings (Jedi). Further, he says that “[it] binds the galaxy together”. The Force field has to interact gravitationally to achieve this, and, hence, its carrier particles  need to have mass. Like other force carriers (electrons, W- and Z-Bosons, Gluons for electromagnetic, weak and strong nuclear interactions, respectively), Midi-chlorians should be particles with integer spin (Bosons). A Feynam diagram of a Force interaction is illustrated in Figure 2. Figure 2. Jedi master Yoda levitating an X-Wing starfigher by the Force as seen in a Feynman diagram. Yoda exchanges Midi-chlorian particles with the X-Wing to lift it. With the overall present, massive, but mostly weak interacting Midi-chlorians, we have our candidate for a dark matter particle. Figure 3 shows the particles of an extended Standard Model including the Force and its Midi-chlorian carrier particle. Figure 3. 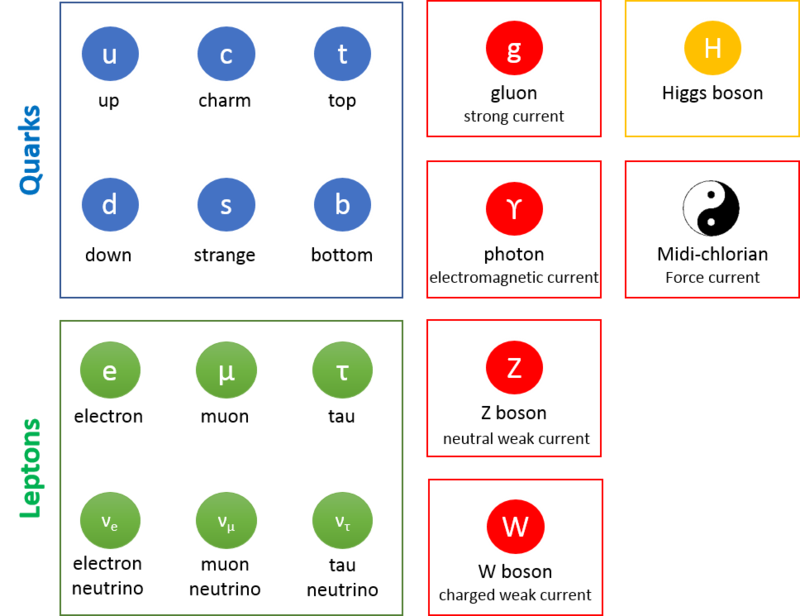 Extended Standard Model including the Force. 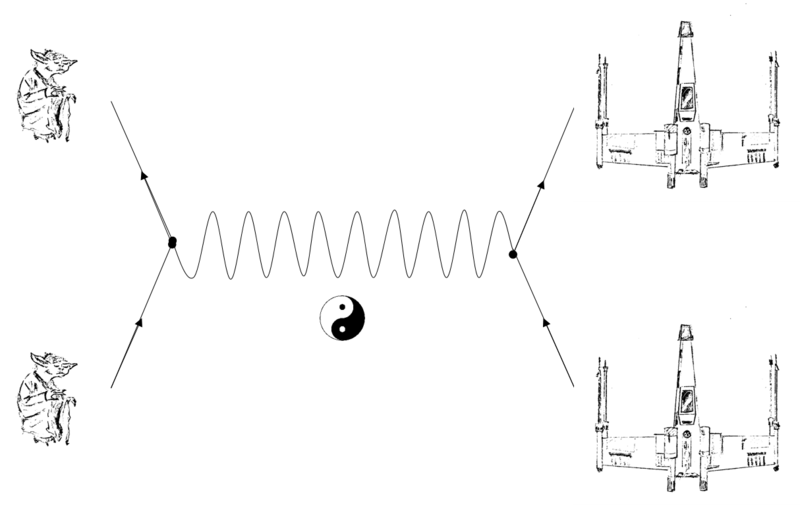 The yin-yang symbol represents two “flavors” of the Midi-chlorian particle: light side and dark side. Assuming the Star Wars galaxy is quite similar to our own Milky Way, I can estimate the mass density of dark matter in this far, far away place. The ordinary mass of the Milky Way is mmw = 4×1011 times the mass of our sun. Dark matter should be approximately five times this mass (25% compared to 5%). As TIEs and X-Wings sound very similar in space and in a planet’s atmosphere (Lucasfilm, 1977; Lucasfilm Animation, 2014), I assume a similar particle density of dark matter Midi-chlorians in space and air in the lower planet’s atmosphere of ρMidi = 2.5×1013 m-3. Comparing particle density and mass density allows me to calculate the mass of one single Midi-chlorian: mMidi = 2×10-33 kg, which corresponds to about 1 keV. That is about factor 500 below the mass of an electron. Midi-chlorians seems to be very, very light weighted – which we would expect for a particle of the overall present invisible field of the Force. What does the parameters calculated above further tells us? Let’s take into account the fact that Anakin Skywalker (when found by Qui-Gon Jinn), who became later the mighty and evil Darth Vader, has a concentration of 20,000 Midi-chlorians per cell of his body (Lucasfilm, 1999) – the highest measured value so far. Unfortunately, we have no information on the measurement’s method, which would allow to verify the theory of dark matter Midi-chlorians on Earth. With 1014 cells in a human body, Anakin’s body contains 2×1018 Midi-chlorians. Anakin, or at least Darth Vader, is a big guy. I assume his value to be equal 0.1 m-3 (neglecting in this approximation, however, his loss of limbs after his fight with Obi-Wan Kenobi). This yields a density of 2×1019 Midi-chlorians per m3 for this user of the Force. That means Anakin’s Midi-chlorian density is larger than the galactic background by six orders of magnitude. This seems to be a reasonable value for the mightiest Sith Lord in history. I proposed Midi-chlorians from the Star Wars galaxy as reasonable candidates for a dark matter particle, giving their mass as 2×10-33 kg (about 1 keV), and showing that Darth Vader has about one million times Force in him than the galactic background. To the best of our knowledge, no Jedi inhabits our Earth and our satellites and probes make no sound in space. As an unfortunate turn of events, we seem to live in a very Force-poor part of the universe – making it very hard to solve the riddle of dark matter on this planet. Future studies will focus on dark energy and its relation to the dark side. In addition, it will be studied whether there is a yet unknown quantum number defining light side and dark side Midi-chlorians and their spontaneous symmetry breaking near Jedi and Sith. Judith Vogt provided advice and a figure. Thanks also to Klaus Erkens und Marc Wolter for useful comments. Ade, P.A.R. & Aghanim, N. & Armitage-Caplan, C. (Planck Collaboration) et al. (2013) Planck 2013 results I Overview of products and scientific results – Table 9. Astronomy and Astrophysic 1303: 5062. Corroll, S. (2007) Dark Matter, Dark Energy: The Dark Side of the Universe. Guidebook, Part 2. The Teaching Company, Chantilly. Freund, P. (1988) Introduction to Super-symmetry. University Press, Cambridge. Lucasfilm. (1977) Star Wars Episode IV: A New Hope. 20th Century Fox, United States. Lucasfilm. (1999) Star Wars Episode I: The Phantom Menace. 20th Century Fox, United States. Lucasfilm Animation. (2014) Star Wars Rebels. Disney–ABC Domestic Television, United States. As a fan of the old movies, it is quite hard for me to mention this topic. However, I will sacrifice true fandom for the sake of science. The Midi-chlorians are also referred to as lifeforms, living in creatures. However, Jedi use the force also on non-living objects. Therefore, the Force is not limited to interactions between microscopic lifeforms and has to be a fundamental nuclear interaction. Even if there actually is a microscopic lifeform with strong connection to the Force field or generation behavior for Force, I use the term “Midi-chlorian” here for the force carrier particle of the Force.